The centered door with its two rows of small flanking windows and the and the half-moon on top. 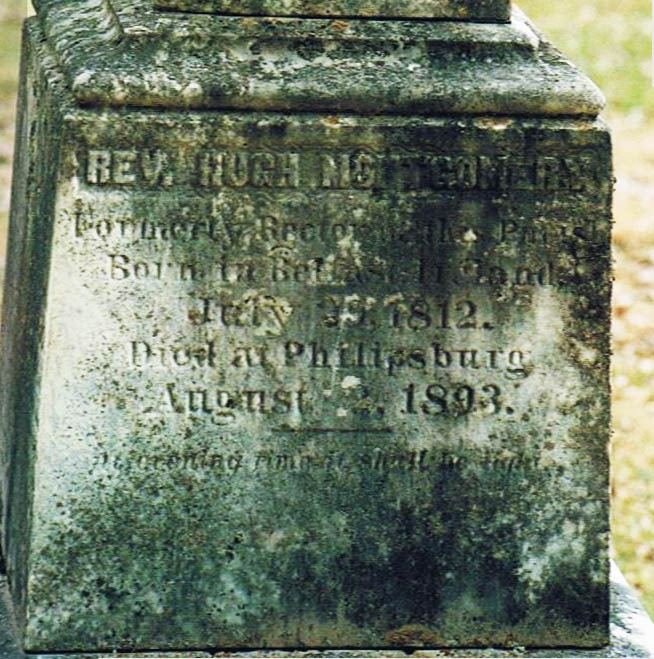 Reverend Montgomery arrived in Philipsburg in 1858. He stayed here until the end of his life, in 1893. He is buried in the Anglican cemetery in Philipsburg, on South Street, that begins just beside St. Paul’s church. This beautiful bourgeois home, built in 1830, is an example of the Georgian architectural style, named after the kings who ruled England in the eighteenth century. It has all the Georgian characteristics: it is a simple two-storied cube, two rooms deep (if we except the obvious later addition). Its entrance is centered and is framed by two rows of small rectangular windows, also typical features of Georgian architecture. 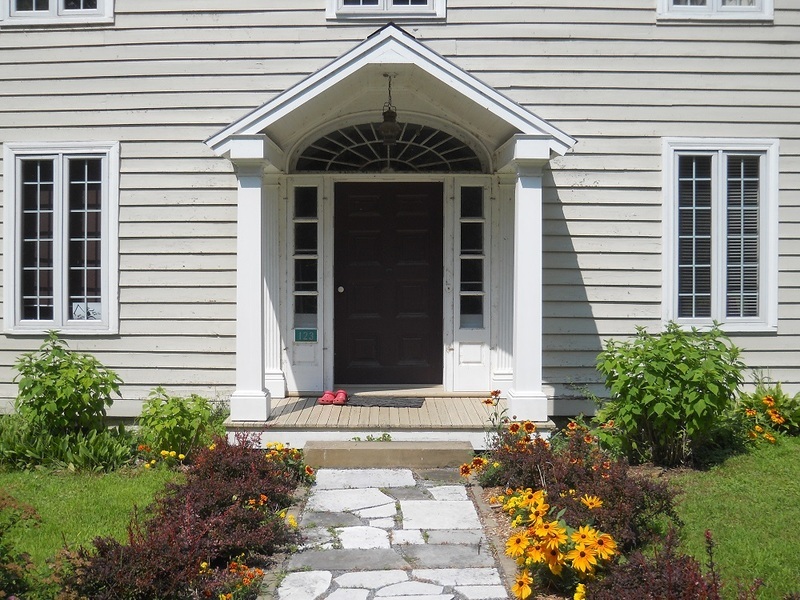 Above the door, the half-moon shaped window adds a touch of Palladian grace (from the name of the Italian architect Palladio) quite common in the loyalist middle-class houses. It must be stressed that if the Georgian style disappeared in the United States after the birth of the Republic, to be replaced by another style called "federal", it continued to spread in Canada, mainly in Quebec and Ontario, where it was maintained by Loyalists of American origin still faithful to King George III. 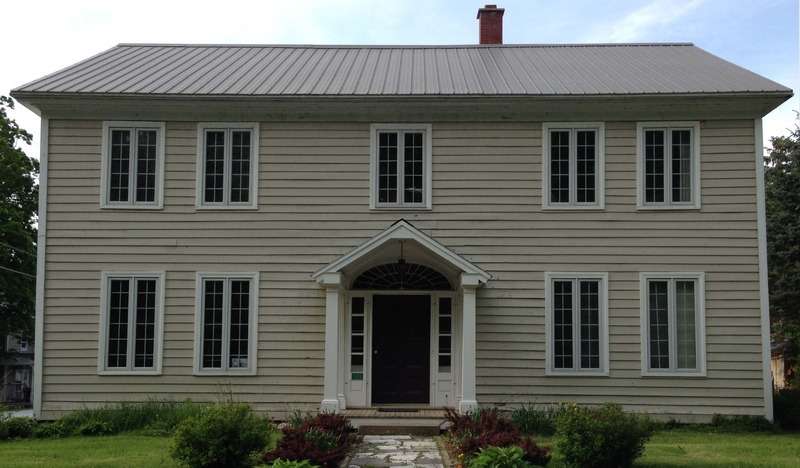 This style dominated the construction of the homes of affluent descendants of the Loyalists up until 1850. The house was inhabited during the second half of the nineteenth century, by the Rev. Hugh Montgomery (1812-1893), fifth minister of the Anglican Church of Philipsburg, and by his family. He was preceded in his ministry by Reverends Charles Stewart (1807-1815), James Reid (1815-1826), Richard Whitwell (1826-1852) and C.A. Wetherwell (1852-1858). You can see St. Paul's Anglican Church, a little further up on Montgomery Street, at the corner of South Street. This beautiful church of Gothic inspiration is the third Anglican construction of Philipsburg. It is dated 1897. The Montgomery family still owns this historic house located on a street that still bears their name.